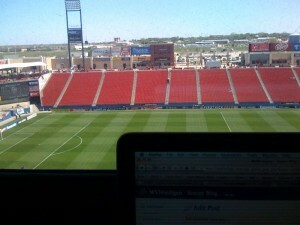 I will be using the good ol’ Twitter function today to blog the FCD-Chivas game. I decided against doing a live chat/blog of the game due to time and lack of energy on my part. For quick updates of the game head over to my Twitter page. The pitch looked beautiful, both in this picture and the highlights I watched.